This article will discuss the latest tax reforms in the Philippines. In a country that makes its citizens pay 30-32% in taxes while a majority is not earning enough, being taxed is a heavy burden for an individual. And the Philippines is one of the countries in Southeast Asia who puts a heavy burden of taxation on its citizens. In their campaign trail for the 2016 Presidential elections, candidates promised a lower income tax as one of their campaign promises. Among the six, Rodrigo Duterte placed those who earn P20,000 as those who will not pay taxes. Now that he won the elections, President Duterte is eyeing a comprehensive tax reform that would benefit the poor, while keeping the rich to pay taxes. That was supposed to be the rationale of House Bill 5636, which calls for the comprehensive tax reform. The proposal was even named as the Tax Reform for Acceleration and Inclusion (TRAIN). The bill is needed to be passed immediately into law, because, as Department of Finance (DOF) Secretary Carlos Dominguez claims that not passing the bill would leave the country in an "unsustainable financial position" and "more vulnerable to fiscal risk." The DOF estimated it would cost the country "an extra P30 billion in annual debt servicing, and P100 billion more in higher borrowing costs for the public." The DOF and the Bangko Sentral ng Pilipinas said the lowering of income taxes and the subsequent increase in excise taxes like the Value Added Tax (VAT) among others would only have a “negligible” effect on the country’s inflation rate. The DOF submitted its first proposal to the House of Representatives in September 2016. This initial package, the first of four, includes the lowering of the personal income tax rates and the reduction of value added tax exemptions. The proposal was revised after immediate imposition of high taxes on fuel and cars was met by opposition from the public and private sectors. The removal of Value-Added Tax (VAT) exemptions for senior citizens and persons with disability were also met with criticisms. The DOF submitted its amended proposal on January 17. The proposed taxation stated that those earn P250,000 or less will be exempted from paying taxes. Bonuses like the 13th month pay will likewise be exempt. Only the 0.1%, the rich, will shoulder a hefty 35% taxation. Should the bill be passed into law this will take effect in January 2018. The obvious winner should be the poor and even the low-earning middle class sector. Unfortunately, the reform still has its con: it included higher rates on VAT, as well as other excise taxes, like the oil excise tax, tax on sugar and its other products, and automobile tax, among others. This was met with further opposition in Congress. Bayan Muna party-list Representative Carlos Isagani T. Zarate said that with these taxes, expenses and basic commodities will significantly increase for most Filipinos. Zarte said by imposing higher excise taxes on petroleum products, particularly on liquefied petroleum gas, diesel and gas, as well as sugar-sweetened beverages the tax measure will definitely hit the poor hard, because it would mean higher prices of basic goods and services. 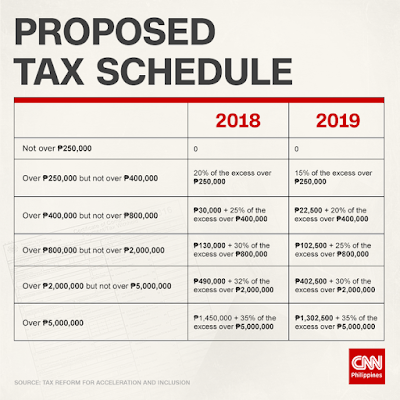 While it is true that those earning P250,000 yearly are exempted from income tax, Zarate said the bill removed the previous personal-tax deduction, as well as the deduction to the medical and health insurance. It will also impose taxes on the fringe benefits of workers. 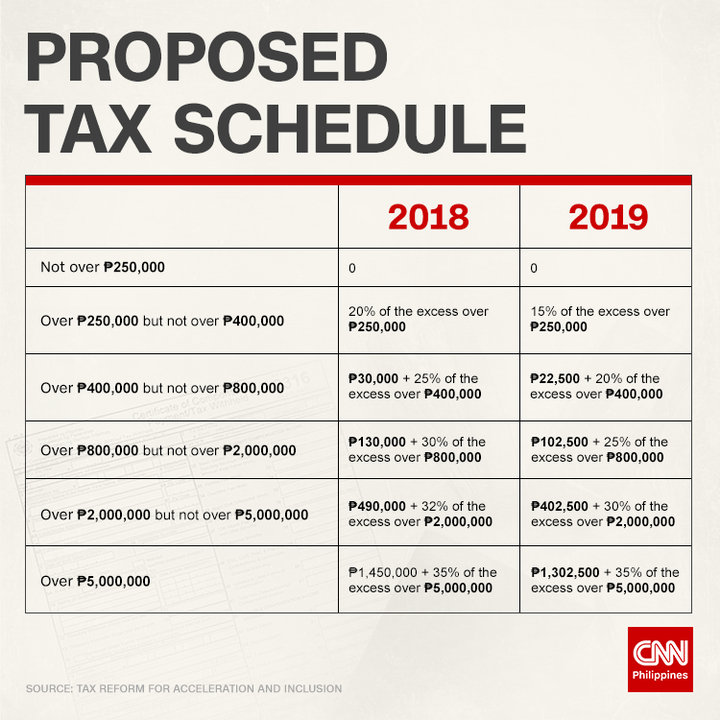 Using DOF data, independent think-tank Ibon Foundation calculated that the rich will be paying a collective Php178.3 billion from their personal and corporate income tax, estate and donor taxes, and capital income taxes. However, consumers will be shelling out a total of Php341.6-B from all the proposed excise taxes. “The government stands to lose up to P152 billion in revenues by 2019 because of the adjusted income-tax structure, but the government is seen to earn at least P320 billion through complementary tax reforms, such as excise taxes and removal of VAT exemptions that would be shouldered primarily by ordinary citizens, especially the poor,” Zarate added. Tax measures are mandated to originate from, and be passed in, the House of Representatives before it goes through Senate scrutiny, as per congressional rules. While the president certified the tax reform bill as "urgent," Congress hurriedly passed the bill on the third reading. It now awaits the Senate version, and the bicameral ruling, as well as the President’s signature. Once the tax reform pushes through, however, it will be far from what Pres. Duterte promised in his campaign as a service to the greater masses.